With so many tech sites and bloggers discussing the potentially major impact the iPad may have on the mobile computing industry, its no surprise others have started to try and capitalize on the buzz around mobile, tablet-style devices. The Windows 7 enabled device, available in both 10 and 12 inch touch screens, will be known as “iTablet” and is made by little known X2 Computing. The iTablet differs from Apple’s iPad significantly. Multi-touch will be optional and specs include rotating hard drives topping out at 250GB, 1.3 megapixel webcam, and a typical netbook 1.6GHz Atom. There are also options available for three USB ports, 3G modem, and HDMI output. Unfortunately, fitting all of this into the tablet makes for a thickness of 1.4 inches; three times that of the Apple iPad. Unlike the iPad, the iTablet will run Windows 7 or Linux, which is obviously something that has made other tablets desirable to those still skeptical of the iPad. Prices have not been announced, however the iTablet from X2 is expected to be available in the UK around the same time as the iPad’s 3G model, in April. 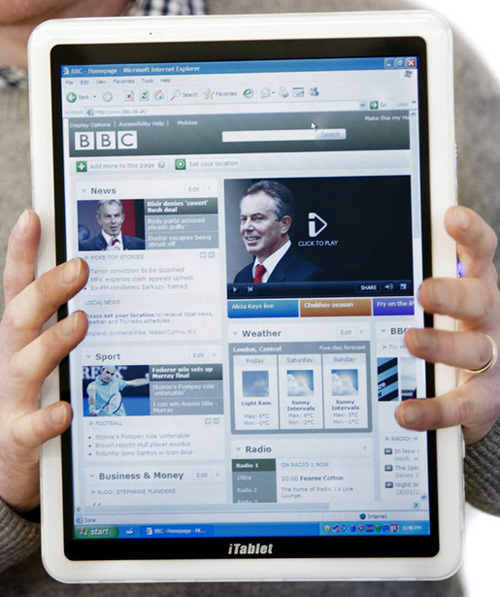 Do you think other tablet devices stand a chance against the iPad? Will Vodafone Get the iPad U.K. Deal? Previous Entry: Will iPhone and iPad Game Development Take Over The Mobile Gaming World? Next Entry: Will a New MacBook Pro Line Up be Revealed Tomorrow?